Adnams, one of the UK’s biggest cask ale producers, have been playing, experimenting and creating a whole new range of beers. Back in 2010 they had a cellar clear out to make way for their spirits production and discovered some crates of old bottled beers….Jack Brand was among them. The bottles were small, brown and labelled with a simple painted cream design. They looked handcrafted, they looked old, they looked like inspiration. Adnams decided to take this old ‘Southwold Jack’ Brand and (updating the label) use it for their new range of limited release bottled and keg beers, keeping one foot in their brewing heritage whilst they push forward with more innovative beers. 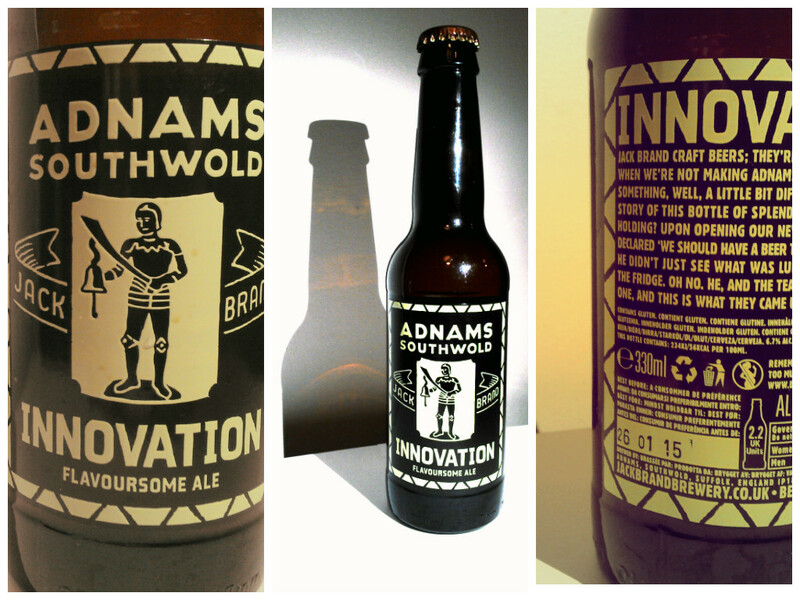 Innovation was the first release – initially brewed as a one off in 2007 – and it brings the hops! It hits you with a big bunch of fruity pineapple hops and mellows with biscuit notes and it goes wonderfully with a curry! Awesome! It’s a fab beer, really hoppy. I found this one in my local Tesco store.